Home > Uncategorized > Winter Wedding Dos! 17 Dec Winter Wedding Dos! The snowy landscape of winter weddings make for a serene and gorgeous affair. In Utah, we are no strangers to the cold, snowy weather, but some wedding guests might be! With several wedding venues to consider in the area, it’s important to start planning early so you can find the right location. However, we are always here to help with those couples that need some last-minute wedding planning tips. Here are some of our top wedding dos and don’ts to consider! Add some color to your wedding. The white snow hopefully will be covering the ground for your January or February wedding, but that white needs to be a little broken up from time to time. While most people know about green and white for the holiday season, we have a lot of fun experimenting with bright, bold colors in the early winter months. The brighter colors are usually a warm welcome for guests. Another important element of the winter wedding is keeping everyone warm. The indoor venues always have some warmth to them, but there are some people that love to have a walkway up to the venue, but some guests may have to wait in the cooler air for some time. It’s important to rent heaters and make sure you are doing everything to keep your guests warm. A lot of couples have enjoying adding hot chocolate to their wedding reception to keep guests warm! While you want to keep everyone warm, you have to consider safety! Will the venue provide snow shoveling and ice melt? If not, will you be able to bring in some people to help? Heels can be hazardous in ice, so you need to take those steps to keep everyone from getting hurt getting to your wedding reception. We have a lot of couples over-prepare for the cold so they crank up the heat in the wedding venue. The downside to too much heat? Your guests can quickly start sweating and overheating when you have people dancing and having a great time together. Sometimes dance floors do have a separate thermostat, so its worth finding out to keep your guests from getting too warm. Planning a winter wedding is a lot of fun. It allows you to be creative, and gives you different options to make your wedding memorable. 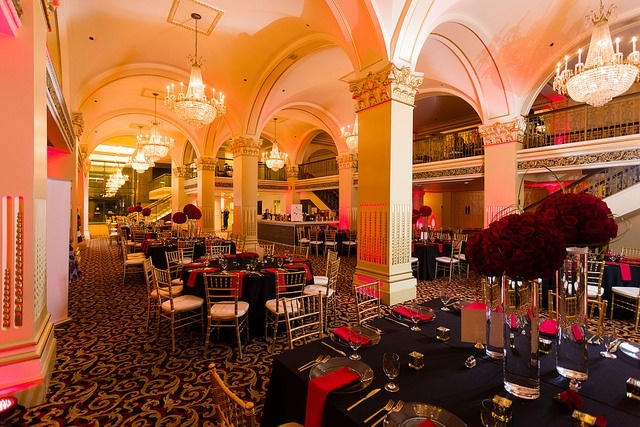 To learn more about winter wedding tips, call Lux Catering and Events today!